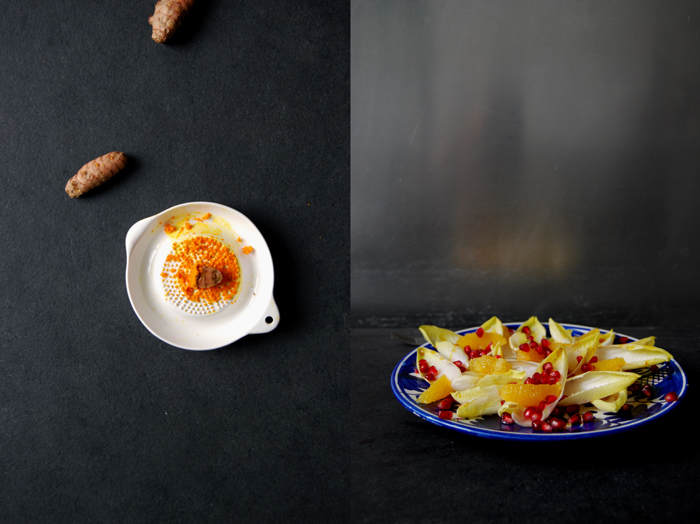 When it’s grey outside it’s time to bring some colours back to our plates! 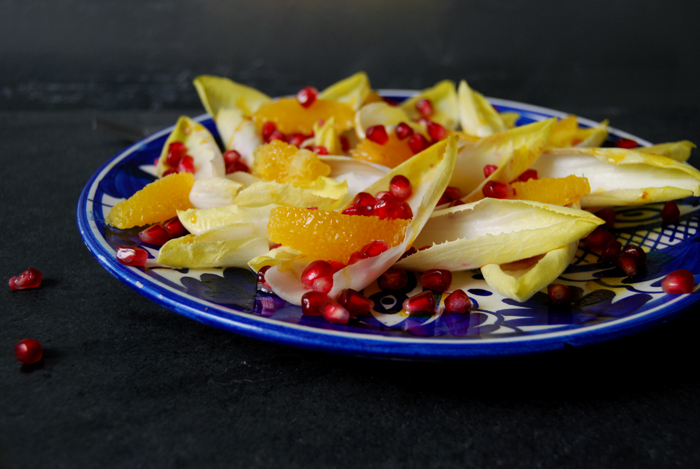 I combined bitter chicory, or endive, the sweetest red pomegranate and juicy oranges in a powerful salad full of strong flavours and vitamins. 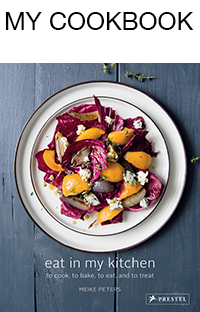 The dressing is a bright yellow aroma bomb mixed with freshly grated turmeric, thick apple balsamic vinegar and a little maple syrup – fruity and spicy. This is definitely a keeper for winter! Fresh turmeric root has a very strong taste, so you have to add it carefully, one pinch at a time, to enjoy its qualities in the dressing. At the moment, my kitchen is stuffed with all kinds of citrus fruits, three big plates piled with lemons, oranges, deep coloured tangerines and the lighter and loose skinned satsumas, or mandarins. 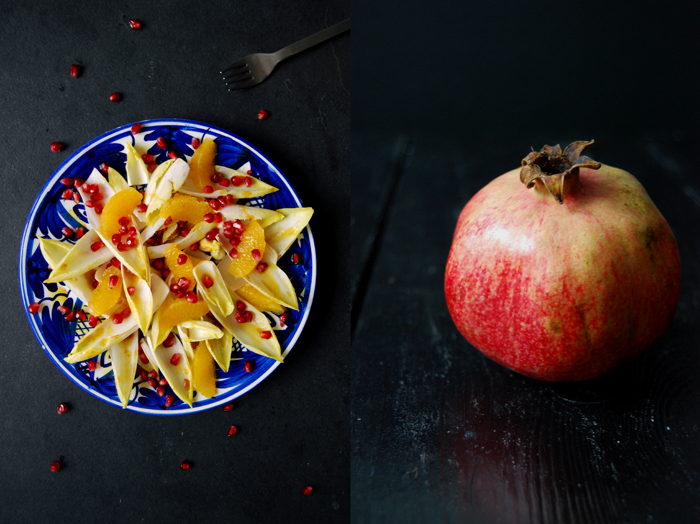 It’s so easy to prepare and strengthen the body for winter when these fruits are at hand. I start every morning with a cup of green tea with half a squeezed lemon, my prevention and cure. When I tried it the first time, I got hooked on this warm drink so it became the daily morning ritual of my life. Since then, about four or five years ago, I have rarely been sick. This is my beloved little ceremony, boiling water and letting it cool down to about 80°C (180°F) to brew the fragrant leaves. My lemons are normally from Italy, and always organic, I pour their sour juices into the light green of my tea and take a few minutes just for myself. This is like meditation, I sit down on my sofa with the warm mug in my hands and relax! 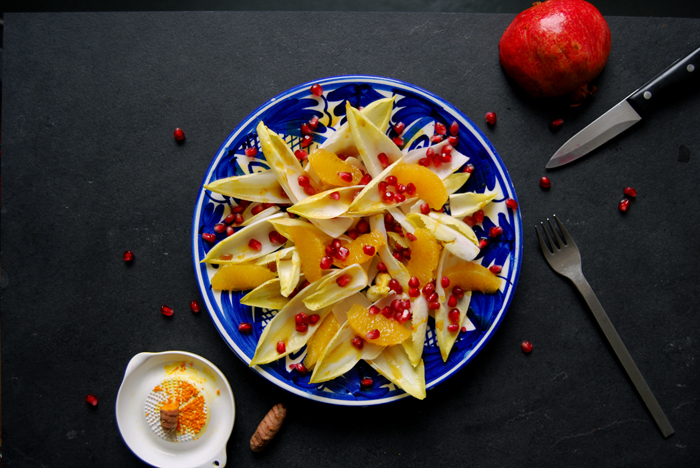 Spread the chicory leaves and orange filets on 2 plates and sprinkle with the pomegranate seeds and the dressing. Gorgeous! And amazingly, here in Bluffton, SC, USA, I found fresh turmeric in the supermarket the other day and have been wondering what to do with it. 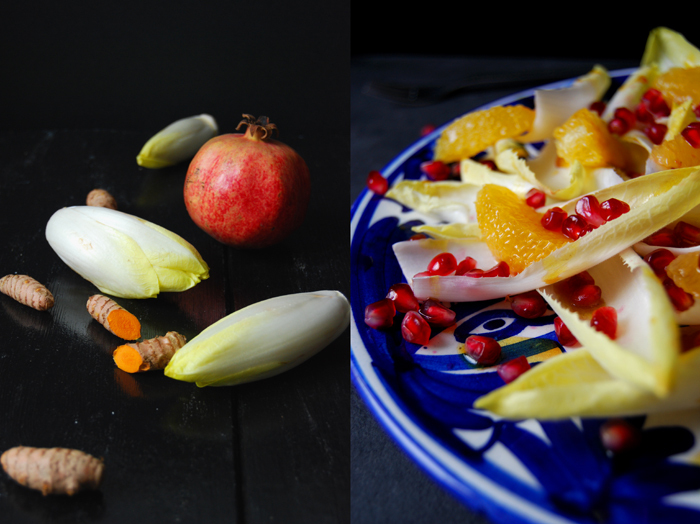 Pomegranate & satsumas in the fridge; dressing ingredients in hand; all I need is the endive. Found a link to your site recently and have been much enjoying it! Warm (literally, I wore a sleeveless dress yesterday!) regards, Diana R.
I can’t really send back warm regards, we’re in the middle of autumn here. But it’s cosy inside, I love that, the perfect time for baking!